Technology is the primary driver of Massachusetts’ economy, which leads the nation in high-tech research and development. Biotechnology and computer technology—as well as finance and education—are a few of the dominant industries in the state, leading to various career opportunities for individuals with skills in health sciences, business administration, computer technology, and other areas of study offered by vocational and trade programs. If a career in one of these industries sounds interesting, read on to learn more about the certificate and degree programs available and what to expect after graduating a vocational program. Massachusetts recognizes the value of skilled workers, and as such has numerous trade and vocational schools to serve them. In addition to these schools, students can also attend community and career colleges where they can study to enter some of the state's fastest-growing fields, like computer technology. 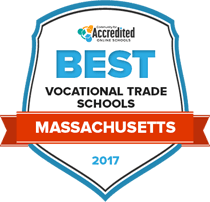 We have ranked Massachusetts trade schools based on criteria most important to students, such as financial aid options, tuition rate, length of programs and the like. All schools on this list are accredited. Students can pursue a variety of programs of study that lead to two-year degrees. The college, which is accredited by the New England Association of Schools and Colleges, Inc., through its Commission on Institutions of Higher Education, offers Associate in Arts degrees, Associate in Science degrees and numerous certificates. AS degrees are designed for students seeking direct entry into the workforce, and AA degrees are intended for students seeking to transfer to four-year institutions to complete bachelor's degrees. The Commonwealth Honors Program (CHP) gives students an honors designation, which helps them enhance transfer applications and increase scholarship opportunities. Students at North Shore Community College can pursue Associate in Science, Associate in Applied Science and Associate of Arts degrees, as well as several certificate programs. After completing a two-year degree, students can transfer to four-year schools across the country. If they choose, students may take advantage of NSCC's MassTransfer program, which enables students to transfer as a junior to any Massachusetts state university or UMass campus. The school's green curriculum project encourages faculty to incorporate curriculum-related environmental and sustainability content into their courses. Students are offered academic advising, career services, career placement, tutoring and access to the student support center. Bristol Community College has transfer agreements with dozens of colleges and universities for students who want to continue their education after earning a two-year degree. The college offers more than 150 programs of study, which culminate in Associate in Applied Science degrees, Associate in Science degrees and Associate in Arts degrees, as well as many certificate programs. Students can choose from four campus locations depending on where they live and what they choose to study. All campuses are accredited by the Commission on Institutions of Higher Education of the New England Association of Schools and Colleges. The college offers many degree and certificate programs across eight academic departments, all of which culminate in Associate in Science degrees, Associate in Art degrees or professional certificates. The college, which has four different campuses, maintains an honors program that is accredited by the Massachusetts Department of Higher Education as a Commonwealth Honors Program. The college is also home to men's and women's intercollegiate sports organizations, as well as dozens of clubs, and social and academic groups. Students also enjoy access to health and wellness facilities, career placement services, children's school, academic advising, counseling services and tutoring. The public, two-year college offers programs that culminate in Associate in Arts degrees, Associate in Science degrees as well as several certificates. The campus provides academic support services, childcare services, social services, counseling services, technical assistance and work-study opportunities. The college also offers PACE (Pathways to Academic & Career Excellence), a student-support initiative funded by a grant from the U.S. Department of Education that offers field trips, career advising and scholarship resources. The campus offers a range of student activities, athletic programs, leadership and enrichment activities, and experiential learning opportunities, such as community service. There are many options for students wishing to enroll in a vocational or trade program in Massachusetts, beginning at the high school level and progressing to adult learning opportunities at one of the state’s many community colleges or trade schools. Search now to find a program near your community that covers your area of interest. Each school district in Massachusetts is required to offer students a vocational education option, with students held to the same graduation standards as those in traditional high school settings. According to the U.S. Department of Education, there were 120,415 students enrolled in career and technical education programs in Massachusetts during the 2013-14 school year. The Commonwealth Dual Enrollment Partnership, a Massachusetts Higher Education initiative, allows high school students to take college-level courses free of charge or at a discounted price, and earn credits toward high school completion and their future college degrees. Students enrolled in vocational education programs have a lower dropout rate than traditional high school students – zero to 2.1 percent for vocational students compared to 2.8 percent for other students. Students in Massachusetts can earn a vocational certificate or associate degree at various educational institutions, including public high schools and community colleges, with certain careers poised for above-average earnings. For example, web developers with an associate degree earn a median wage that is 17 percent higher than the national average, and can look forward to an anticipated job growth that outpaces the national average—23 percent in Massachusetts compared to 20 percent nationwide. Positions in several other fields, such as registered nursing and dental hygiene, also pay more than the national average. While bachelor’s degrees remain the most common credential earned in the state, career opportunities abound for those with certificates and degrees below the bachelor’s degree level. Four of Massachusetts’ 10 largest employers are healthcare systems, including Massachusetts General Hospital, Steward Health Care System, Brigham and Women’s Hospital, and UMass Memorial Health Care. The state also boasts a dense concentration of universities, research institutions and teaching hospitals. Taken together, these help sustain a robust industry of biotech and drug development, with more than 550 biotech companies doing business in Massachusetts. The healthcare industry has also created a strong job market for vocational occupations such as nursing assistants, licensed practical nurses, medical laboratory assistants, and registered nurses, with each of these positions commanding median salaries higher than the national average. Another strong performer in Massachusetts is the tech industry, which was responsible for almost 20 percent of the state’s wages over the past decade. Companies such as EMC, which offers data storage solutions, continue to grow rapidly and provide opportunities for those with certifications and two-year degrees in computer science and technology. The table below shows vocational jobs compare in terms of current job opportunities, anticipated growth, and annual salaries. As the largest city in the state, Boston has a strong presence in technology, education, health and life sciences, and finance. As one of the nation’s top 10 tourist cities, Boston also boasts a large number of service jobs to support this sector. More than two dozen higher education institutions, including technical schools and junior colleges, are located in Boston, offering numerous opportunities to those seeking vocational or trade programs. Bunker Hill Community College is the city’s largest public community college with more than 14,000 students. It offers certificates and associate degrees in more than 20 areas; the most popular are in law enforcement, health professions such as medical assisting and registered nursing, computer and information services, and business administration. Urban College of Boston is a private college offering a smaller selection of certificates and degrees in education, general studies and public administration. With the projected growth for hairstylists and cosmetologists at 24 percent, almost twice the national number of 13 percent, the Empire Beauty School - Boston and Jupiter Beauty Academy offer certificates in general cosmetology, aesthetician, and nail technology to meet the demand. Other schools with more concentrated and focused programs include the New England School of Photography and North Bennet Street School, a trade school with certificate and degree opportunities in areas such as locksmithing, jewelry making and repair, cabinetmaking and bookbinding. Provides state-specific information about CTE programs including career clusters, financial aid, program performance, and levels of vocational certification available. These organizations ensure strong CTE programs through innovation, community and business partnerships, and leadership experiences for students. Provides an overview of what career development education offers students, and works to ensure that programs throughout the state offer quality activities. Provides a comprehensive list of resources for specific vocational programs, such as state board requirements and a list of schools in the state with vocational technical education programs. Offers Information for prospective students and parents about colleges and university options, financial aid, and the Commonwealth Dual Enrollment Partnership. Assistance for residents looking for jobs via job fairs, resource lists, special events and information for special groups (long-term unemployed, disabled, veterans, etc.). Resources for Massachusetts residents to find jobs, connect with employers and learn more about the local labor market.